"I fall on my knees before the Father." Wednesday September 26th 7:00am Elma High School Flag Pole. The Apostle Paul, a murderer of Christians turned missionary for Christ, wrote to the church at Ephesus that he falls on his knees before his heavenly Father in a spirit of humility and brokenness, pleading for Him to move. Paul was never going to tell the church to be humbled before making sure he was humbled first! That is the key! Today, we know there is cultural chaos, political unrest, division, and a downward spiral of morality. But darkness is just the absence of light. Our generation needs the spirit of Christ to fall down on us and shine bright. We are ripe for revival! The psalmist wrote, “The sacrifice you desire is a broken spirit. You will not reject a broken and repentant heart, O God” (Psalm 51:17). God desires an open heart ready to receive all He has. We can’t please Him by our outward actions, no matter how good we are, if our heart is not right with Him through Christ. Do you feel the brokenness all around you? Do you want to experience the spirit of God falling on your campus? For that to happen, we must start with praying just like Paul to say, “God, start here in my life.” Break me, oh God. Let revival begin with me! When God has answered your prayer, the revival has begun! At a youth prayer meeting, a little over a century ago, a young teenage girl named Florrie Evans rose to her feet and said, “I love Jesus with all my heart!” Immediately the Spirit of God fell in that place. That brokenness began to rapidly spread to students and out into the community like wildfire. Florrie’s simple, short confession of a humble, broken heart sparked a revival that eventually spread to five continents around the world! Yes, just one girl impacted her entire generation. Cultural statistics are reporting we are either on the brink of a dark age in Christianity, or on the brink of a great revival. Repentance in this century can happen today! Revival in your generation can start with you! Are you willing to be broken before God? Then draw your circle. Fall on your knees. Announce that you love Jesus. Let revival begin with your heart. 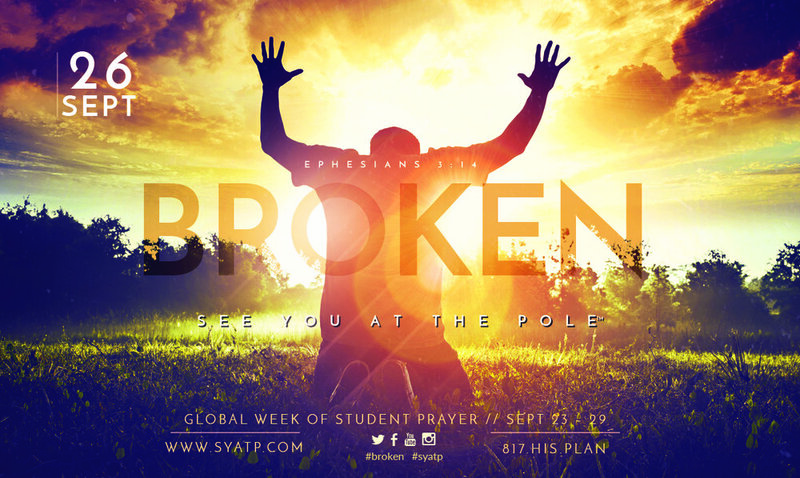 Commit to pray for students around the globe as they gather for See You at the Pole™ on September 26, 2018!